One of the most noteworthy, historic and prominent landmark buildings in Hampton village is the parish church of St Mary’s which stands on a hillock or mound about six metres above the level of the river Thames and about 20 metres away from the riverbank. There has been a church on this site for more than 650 years. The present church was built in 1831. The main access to the church is via the south-west door. This can be approached via the steps from Thames Street or via the footpath through the churchyard from Church Street. The Church is constructed of white bricks with stone edging. It has a Tower which is about 80 feet high which houses a peal of 8 bells and St Luke’s Chapel. The crown surmounting the tower flag staff symbolises the connection with the Sovereign, who has long “held the manor.” The St George cross pennant was added in 2004. St Mary’s Church, has a central nave, two side aisles, high altar, nave altar, north side chapel, organ, choir stalls and pews. Inside the church we still feel much of the welcoming atmosphere of the early nineteenth century, though the church’s interior was much altered in the ensuing years particularly during the incumbency of Hampton’s long-serving vicar, Prebendary Robert Digby Ram, who held office from 1882-1911. 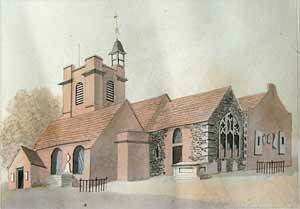 The original church was founded on the present site in 1342, by monks from the Essex Priory of Takeley. The present church was built in 1831 when the previous building, which also housed the Grammar school, was no longer large enough for the large congregations of that time. In 1888 the new eastern end Sanctuary was added with the fine stained glass windows, changes were made to the west end and the organ was moved to its present position. The St Mary’s church site adjoins both Church Street and Thames Street (A308). The church is illuminated each evening. The best place to view the outside of the church is from Hurst Park in Molesey fields on the other side of the river. This is the ground floor room of the Bell Tower. 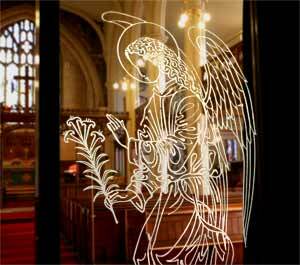 Its inner glass doors are engraved with designs by Eric Fraser. They enable one to look into the interior of the church even when the church itself is not open. Its main uses are for weekday morning services, for babies and young children to use during Sunday Services, and for private prayer. The outer door is kept unlocked during normal working hours so that visitors may have free access. St Luke’s Chapel in the West Tower is open for prayer and church viewing during normal daytime working hours. Access to the main part of the church is on certain days only having regard to the modern security need to have someone in attendance when the church is open. The churchyard is accessible at all times. On several Sunday afternoons each summer guided tours are provided. The Stained Glass Windows in the Sanctuary (the east end of the church that contains the altar), 1888, are among the chief glories of the church. 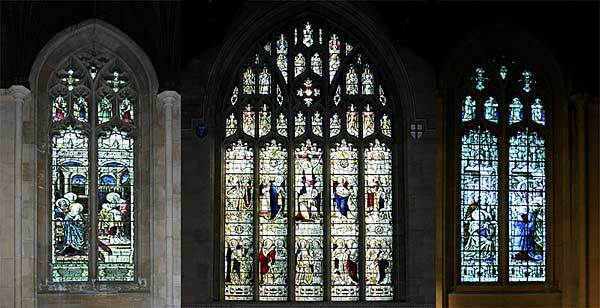 The main east window behind the altar is called the ‘Te Deum’ window. On the north side is the ‘Magnificat’ window and on the south (river) side is the ‘Nunc Dimittis’ window. The window in the North Wall represents the Annunciation of the Virgin Mary, patron saint of the church. On the South Wall the window depicts the four Archangels. Michael, Raphael, Gabriel and Uriel. 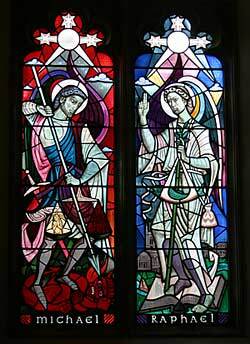 Both windows were designed by Eric Fraser (1902-1983), the nationally famous graphic artist and illustrator who was a member of St Mary’s congregation. The Oak Reredos (an ornamental screen placed behind an altar) with its flying angels was installed in 1914. The Oak Chancel Screen (1920) in front of the Sanctuary is Hampton’s War Memorial commemorating Hampton’s war dead from both World Wars. The Effigy of Sibel Penn (in the south porch). Nurse to Edward VI, she died in 1562. She lived close to the church at Penn’s Place, Church St. She is reputed to haunt Penn’s Place, Hampton Court – and the church. 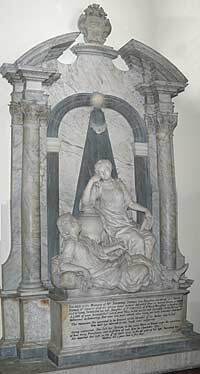 The Tomb of Susannah Thomas, 1731, (on the east wall of the south aisle) where Susannah is shown reading to her mother, both in classical dress. It bears a fascinating description, evocative of eighteenth century life. ‘Harris wanted me to get out at Hampton Church to go and see Mrs Thomas’s Tomb. ‘Who is Mrs Thomas?’ I asked. ‘How should I know’ replied Harris. ‘She’s a lady that’s got a funny tomb and I want to see it’. On the tomb the inscription includes the following description of Susannah Thomas "A lady of great Accomplishments and of great piety, in her person most agreeable, in her humour and behaviour so endearing, that none was more valued when living nor more lamented when dead." "Dying unmarried, she left her fortune to her next Heirs in Blood, under the restriction of their being Protestants, and in failure of such Issue to Charitable Uses." The Mural on the West (rear) Wall was painted by Rev Geoffrey Fraser, Eric Fraser’s son, in 1952-3. Below the figure of Christ are painted two panels, either side of the West Door. 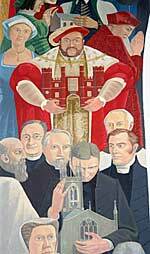 On the left are depicted many famous figures from local history including Henry VIII and Cardinal Wolsey and on the right are officers of the Church and members of the congregation at the time when the mural was painted. 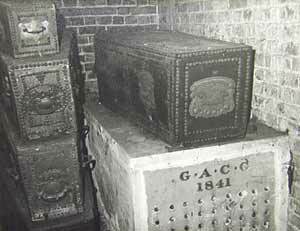 The north vault contains many old coffins, is chilly and atmospheric and makes a memorable visit. Guided tours are available during the summer fete in June each year and at other times by request. The south vault is permanently bricked up and therefore not accessible. The vaults are much older than the present church. At least 600 years old. Partially closed in 1883. In 1972 it was renovated. Most of the headstones were taken away but some of the more interesting ones were retained. Within the churchyard is the Garden of Remembrance which is still in use. This is a very substantial property which was built in 1884. The church has had a strong connection with the Sovereign who has long held the Manor of Hampton and hence the crown on the top of the flagpole and the St George pennant. Above the West Door are the Royal Arms that were originally fixed to the front of the Royal Pew that was in the north gallery of the original church. In past times the congregation frequently included royalty. Among these were the Duke of Clarence who became King William the Fourth and reigned from 1830-1837. Since 1544 the Sovereign has “presented” the Vicar of Hampton , except during Cromwell’s protectorate, most recently via the Lord Chancellor. 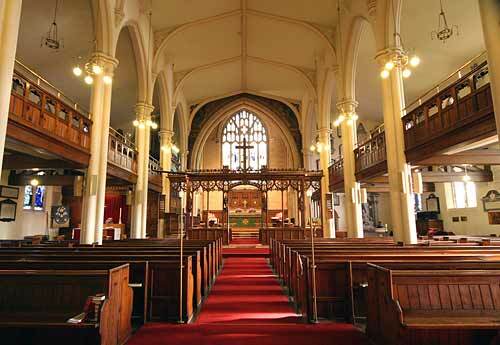 St Mary’s is a place of Christian worship within the Church of England. Sunday Services are held at 8am, 9.30am, 11am and 6.30pm and all are welcome to attend. This pattern is varied slightly at Festival times. There are weekday services at 9am and at other times. 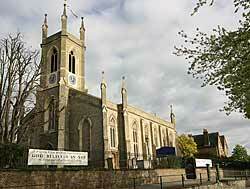 It is in the Kensington Area of the Diocese of London.